Canton, about eighty miles north-west of Hong Kong on the Zhu Jiang or Pearl River, had, since the early eighteenth century, been the only port in China (except Macao for the Portuguese) through which Western countries, and in particular the East India Company, were permitted to trade. The actual trading took place along a stretch of river called the Thirteen Factories. Canton was one of the ports to be opened to foreign trade and consular representation under the 1842 Treaty of Nanking, which ended the First Opium War. A consulate was accordingly established in 1843 and housed near the Thirteen Factories in a comfortable building designed for occupation by foreigners. When that burnt down, the consulate functioned for a while in boats. In trading terms, Canton gradually lost ground to Shanghai. 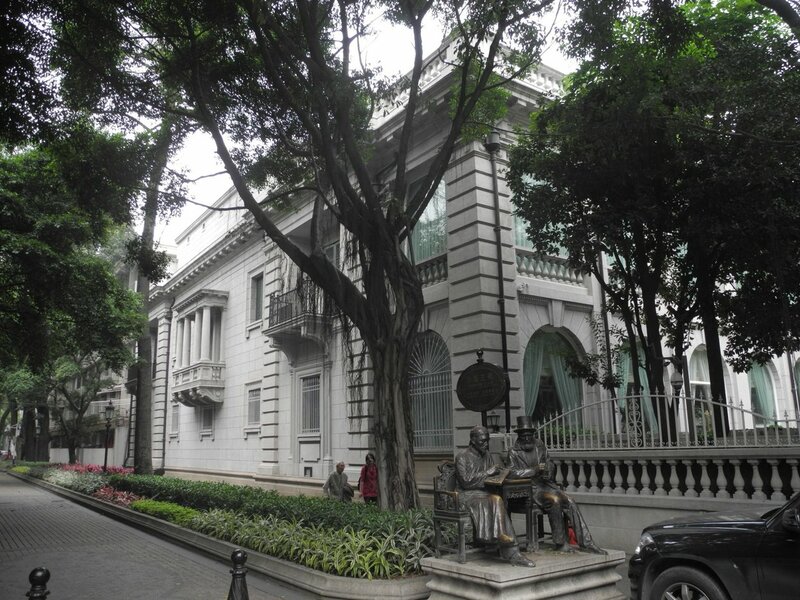 At the start of the Second Opium War in 1856, the consulate was withdrawn to Hong Kong. 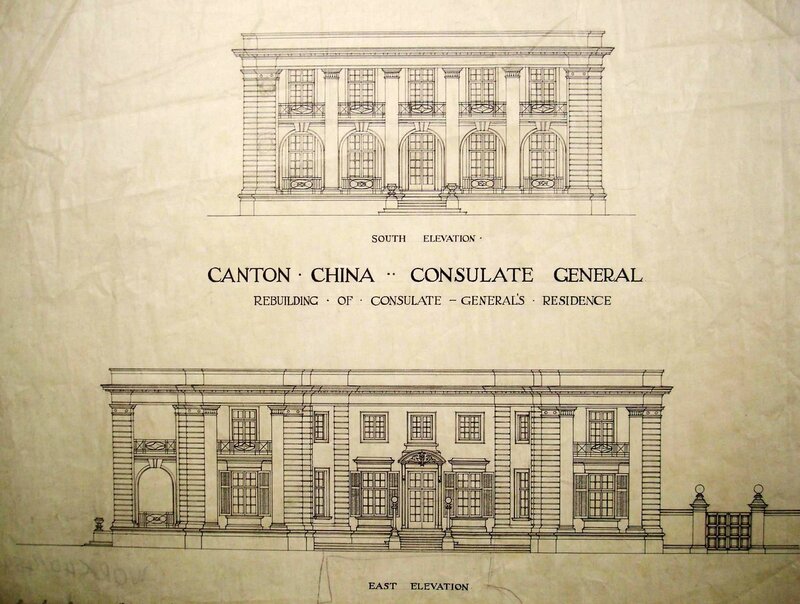 When the Treaty of Tientsin was signed in 1858, the consul, Harry Parkes, returned to Canton to lead a commission with responsibility for administering the city until British and French troops handed it back to the Chinese, which they did in 1861. From this position of authority, Parkes selected a site for a concession area that would be safer and more suitable for future trading than the Thirteen Factories site. He chose to reclaim land on an east-west lying sandbank, parallel with and close to the northern bank of the river. It was a huge project that took two years to reclaim and protect with solid masonry embankments. The reclamation was called Shameen island, 875 metres long and 300 metres wide, and separated from the Chinese city by a canalised creek, crossed by a bridge at either end. The British funded 80% of the costs and the French the balance, and this was the ratio in which the island was divided between their two concessions, with the British ending up with about 18 hectares at the western end. 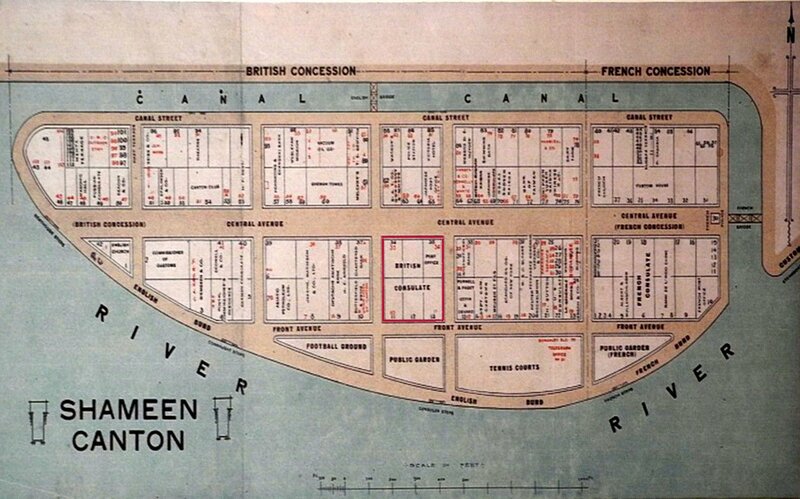 The British concession area was divided into 80 lots, of which Parkes allocated six in the middle, comprising nearly 0.8 hectare, to a future British consulate, later consolidated as Lot 49, lying between Central and Bund Avenues. Parkes sold most of the rest at auction to the merchant houses. 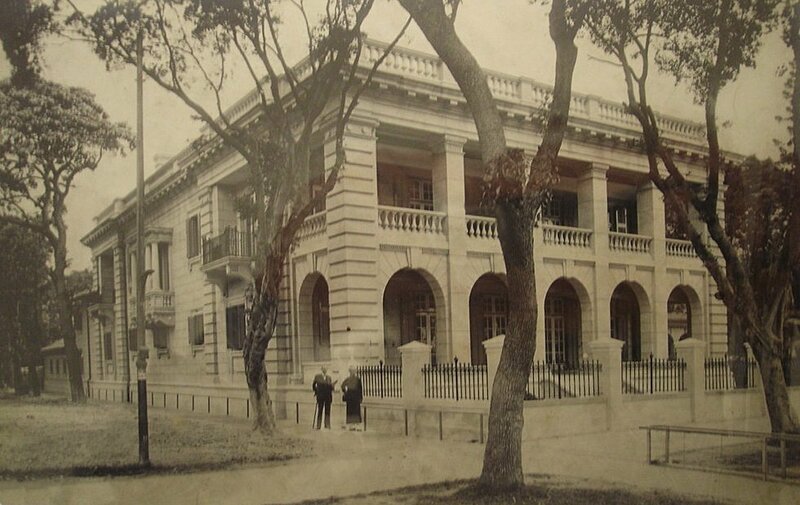 The British consular buildings were designed and supervised by Charles St George Cleverly, then surveyor-general of Hong Kong, and built in the early 1860s around three sides of a court, with a large grass lawn, that was open on the fourth (south) side to the Bund. Across the north of the site came a large building with the offices on the ground floor and three apartments for assistants on the first floor. DOMINE SALVUM FAC REGEM – O Lord, Help the King – was inscribed across the entrance to the offices off Central Avenue. To the southwest was the consul’s house, and to the southeast the vice-consul’s. The constable’s quarters and gaol were in the northeast corner. The rest of the compound perimeter was given over to servants’ quarters. Since the consul himself did not live at Shameen (see Other Accommodation below), his designated house in the compound was let to the Imperial Customs. 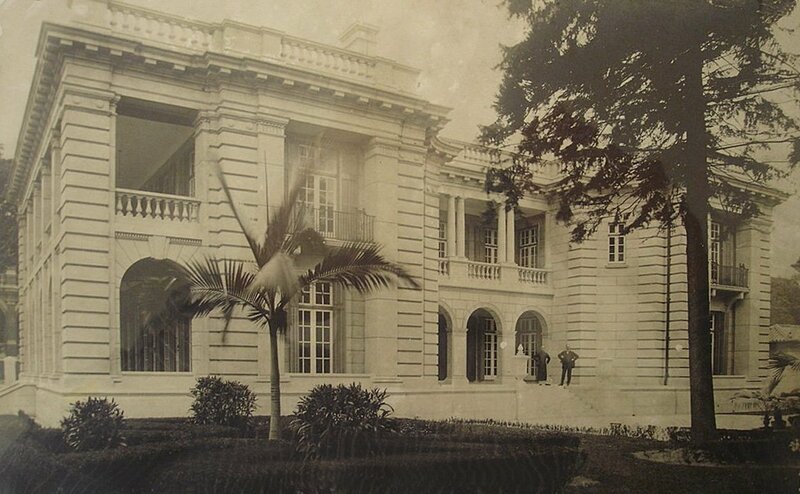 These buildings were severely damaged by floods in 1915, and the residence for the consul, by then upgraded to consul-general, was rebuilt in 1921. The assistants’ quarters collapsed during a typhoon in Sept 1921 and were reprovided as two flats above the offices in a new building that was completed in 1924. W.J. 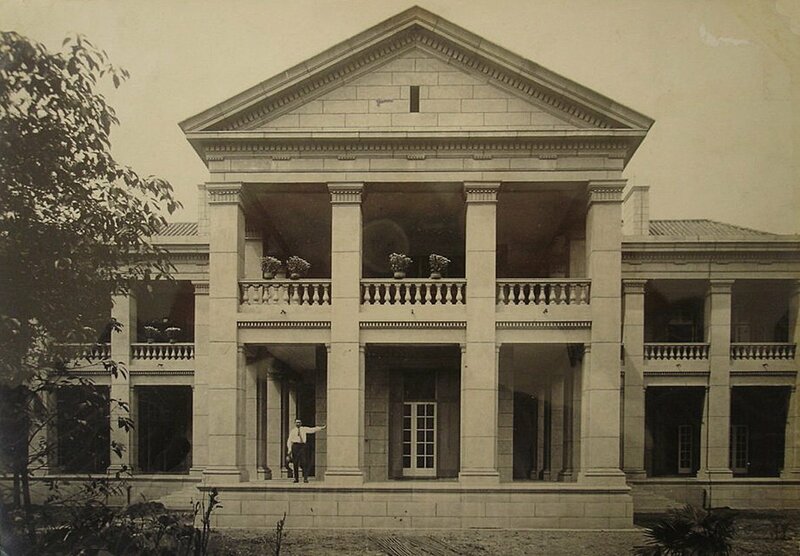 Roberts, the Office of Works architect in Shanghai, designed a new vice-consul’s house on which site progress was interrupted in June 1925 by boycotts and strikes so that it was not completed until 1927. 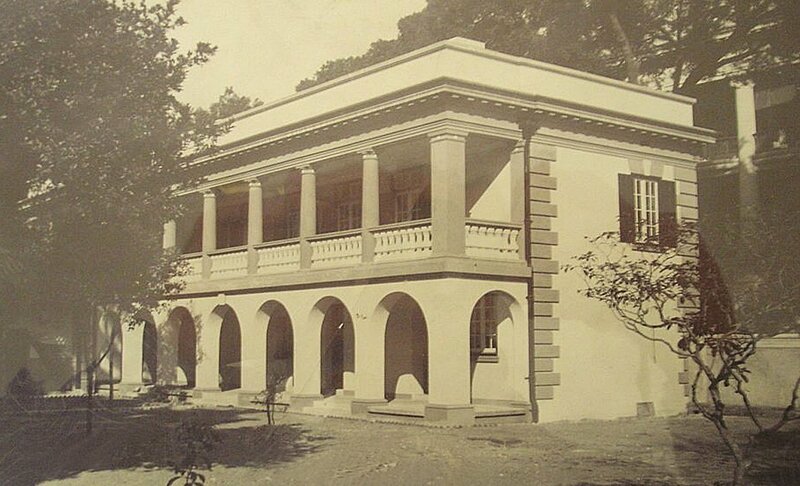 By 1928, therefore, practically the whole compound had been rebuilt: not wholly successfully, because the roof of the consul-generals’s house was dangerously close to collapse by the late 1930s and needed extensive works. The concession area was returned to Chinese administration in 1943. A great deal of damage was done to the buildings in January 1948 when rioters looted and burned the British compound. The houses were repaired within a few months but the offices had to move into leased premises nearby, at 18 Fook Hing Road, for most of the eighteen months or so that it took to rebuild the office building, substituting offices for the flats on the first floor. The titles to the Canton properties were exchanged for perpetual leases in 1951. The Post closed in 1953, and the properties were sublet until sold in 1973. 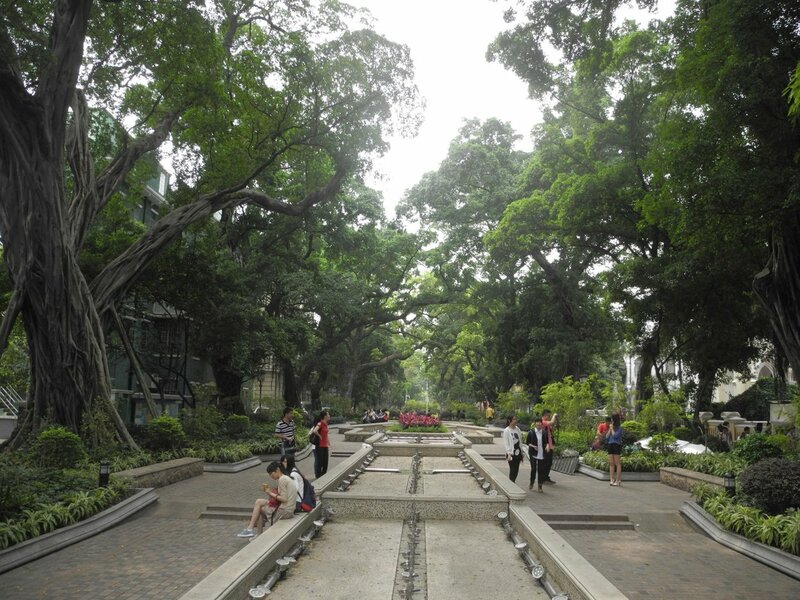 The compound and its buildings has since been well maintained, with some careful adaptations, and now houses the Guangdong government’s Foreign Affairs Office. Until at least the turn of the century, the consuls themselves lived inside the Chinese city, three miles from Shameen, both to demonstrate that the right of entry into the city had been won, and to be close to their main interlocutor, the intendant/viceroy/taotai. 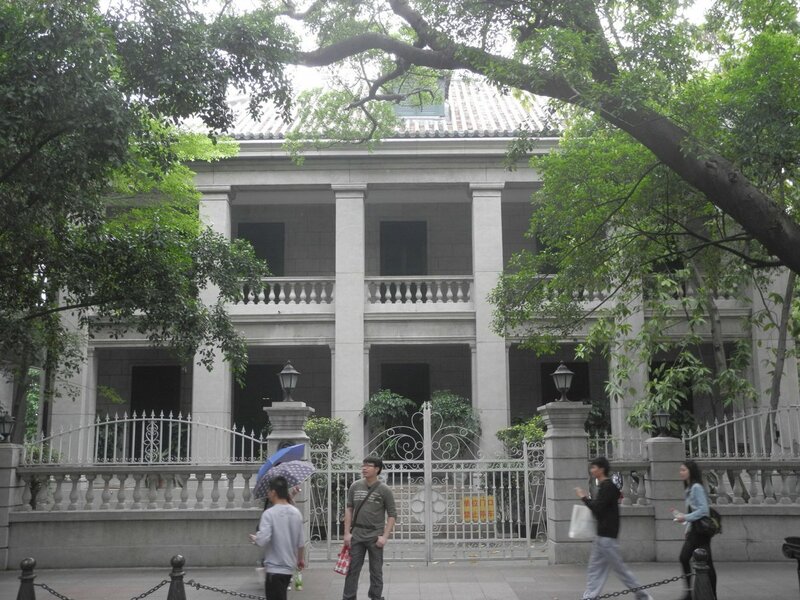 The residence they used was a Chinese yamen, or palace, called the Woo-shih-shan. It lay in part of the Manchu general’s palace grounds in a four acre enclosure, surrounded by a deer park of another four acres. The Office of Works continued to maintain the yamen until the consul moved to Shameen. The yamen was then used by six or so Colonial Office student cadets learning Cantonese under the auspices of the Hong Kong government. 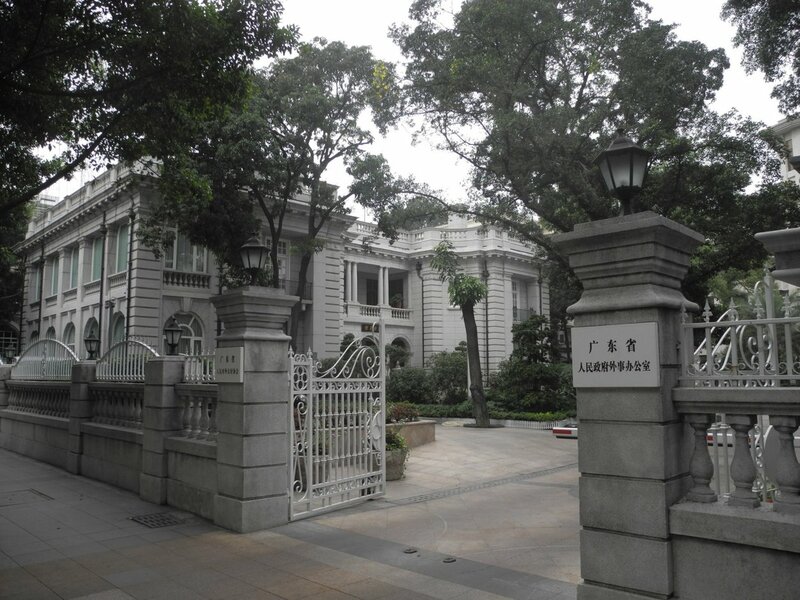 The Office of Works later sublet the yamen to the Hong Kong government and it built another house on the site in the mid-1920s for another six cadets. The lease of the yamen was finally given up in 1928. 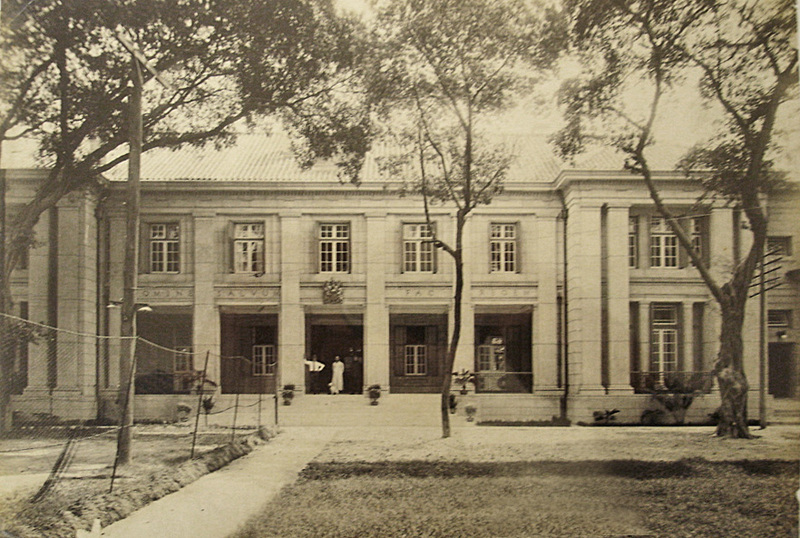 After the First World war, the consulate became involved with two other properties. In 1917, it took possession, as ‘Agents of Necessity’, of the Russian consulate at Lot 36, where the lease had lapsed through non-payment of ground rent, and sublet it, including to Imperial Chemical Industries. Two years later, the German consulate at Lots 10 and 27 was handed to the British government. The Custodian in China of Enemy Property proposed that the Office of Works should take over the German lease so as then to be able to dispose of the property. This it did by selling it to the Asiatic Petroleum Company in 1921 for £34,275. Shameen Island from the air, c.1920. 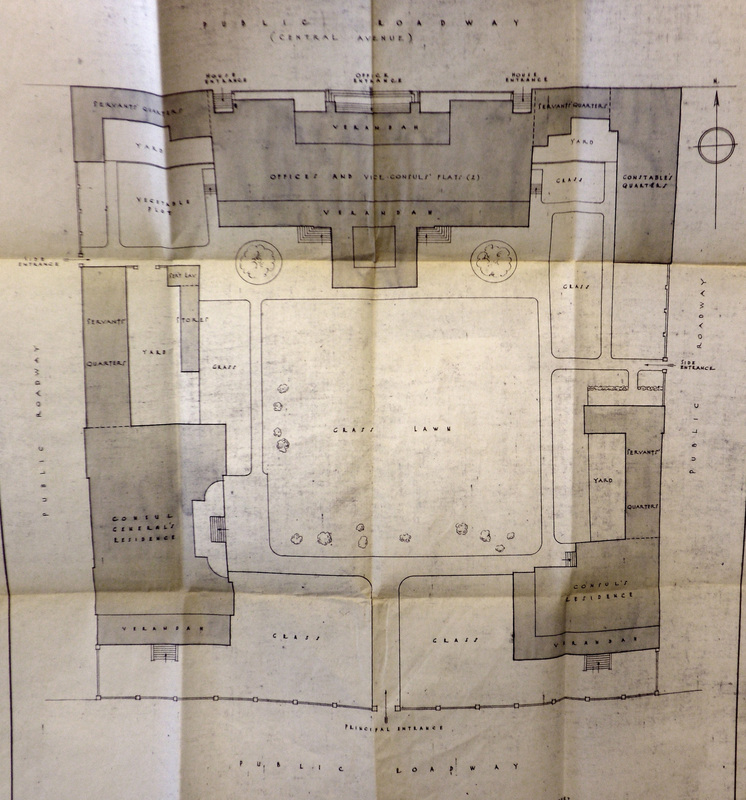 Plan of Shameen compound, 1948. Entrance to offices, from Central Avenue, c.1910. Entrance off Central Avenue, 2013. Front elevation of residence, 1917. Residence, soon after rebuild, early 1920s. Constable’s quarters and gaol, 1917. 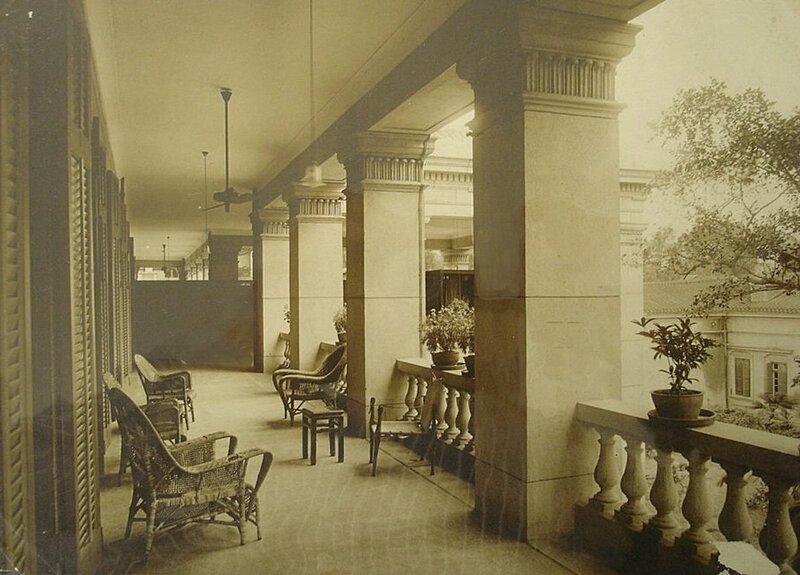 South, garden, front of offices, 1920s. 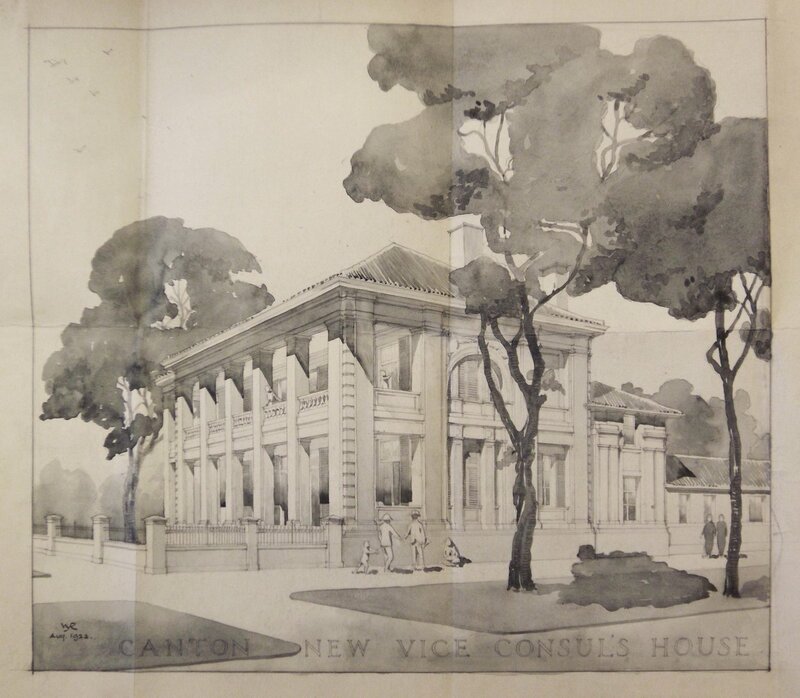 Drawing by Roberts for rebuilt vice-consul’s house, 1922. Rebuilt residence, viewed from Front Avenue, early 1920s. Residence, from Front Avenue, 2013.